I’m not saying this because I am a Dallas Cowboys fan. I’m not a Cowboys fan, even though I am a Texan and Dallas area resident. I have come to hate professional sports, especially the NFL and its many entitled crybaby multimillionaires. I am still a football fan, but only at the college level, which is far more enjoyable than the NFL, anyway, in my opinion. It is refreshing to note that not all NFL players fall into the “crybaby” category. Most are actually apolitical. However, there are also a few staunch patriots on the rosters of NFL teams and they are as disgusted as the rest of us by the disrespect kneeling during the national anthem has brought to a game many millions have enjoyed but a significant segment of which is walking away from. 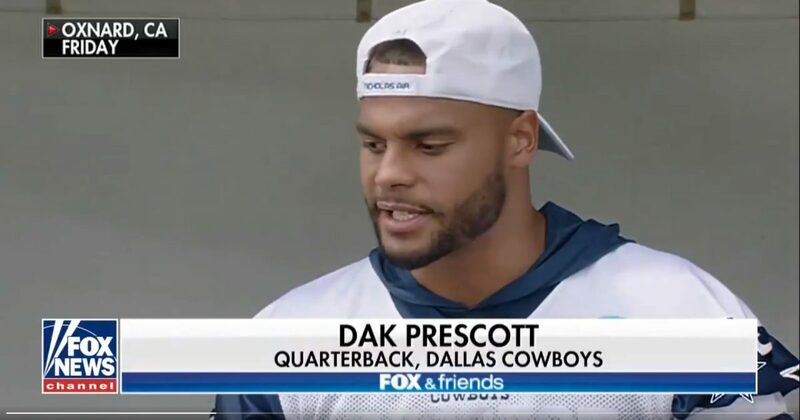 Dallas Cowboys quarterback Dak Prescott is one such player and patriot. Watch the video below as Prescott backs up his boss, owner Jerry Jones, who announced a few days ago that there would be no kneeling or other disrespect shown by Cowboys players in the coming season and beyond, which is the right and proper decision all NFL team owners should be making. It isn’t difficult. If not for patriotic reasons, then owners should not be so stupid that they can’t see the looming big picture commercial disaster that there was just a hint of last year. It can and will get a lot worse if owners continue to allow a handful of morons, kneeling like $10 hookers, to manage their teams, their business and their personal fortunes, as well as the fortunes of all the other players and staff, not to mention destroying the enjoyment of millions of fans while earning their disgust and total disrespect. The owners are in the driver’s seat. They can fix this. Jerry Jones did! I would much rather see millionaire kneelers thrown off the team and replaced by journeymen players, even if it means one or two more team losses, than to see the disgusting sideline spectacle loser Kaepernick brought to professional sports. Owners can simply inform players that kneeling during the anthem will result in a fine of $1 million. That alone should nip the stupidity in the bud. Add even more fine money, indefinite benching, and being cut from the team, and I guarantee you the stupidity will stop and the NFL MAY be salvaged. Well done, Dak! Your support of Jerry Jones' decision to stop the kneeling makes you a true patriot IMO. The whole spectacle caused me to swear to never watch the NFL again. Based on your defiance to the stupidity, here's hoping the Cowboys win the Super Bowl by 100 points! Bingo, La'Maze! I was about to say the very same thing. The moral relativism of some people only embarrasses them for their blindness and ignorance. True! We all have the right to be as stupid and disrespectful as we want. It doesn't mean others have to like it, tolerate it, or pay for it. How about a little respect for those who have fought and died for your First Amendment rights? You haven't considered them, have you? COOL……THERE IS HOPE WE WILL GET FOOTBALL BACK…..while they are working out their differences I cancelled DSS Sunday Ticket. You will find me at Barefoot Beach in Bonita Springs Florida on Sundays. The real athletes/hero's remains are coming home from The Korean War NOW.. There is no problem! Blacks who charge police officers and try to take their guns are going to be shot. Likewise, whites, Asians, and gay, left-handed Martians!